All significant works of architecture began as visions of their architects. Before those visions could be realized however, the architects had to rely on a set of tools which allowed them to communicate their visions to builders. These tools have undergone a paradigm shift in just the past few years. I contend that something as simple as this, the use of a different set of tools, has significantly impacted the direction of contemporary architecture, paving the way for a new type of architecture, deconstructivism. This post serves to support this point of view. Until the latter years of the twentieth century, architects produced construction drawings using the same tools their forbearers had. It began with the scale, which allowed the drawings to accurately communicate lengths and sizes to the builder. 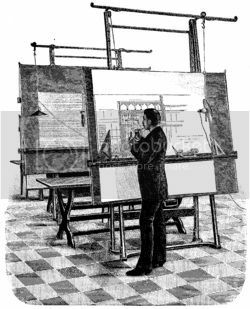 The drafting table allowed large scaled drawings to be generated. A T-square or parallel bar was used for drawing horizontal lines, while triangles were used for drawing vertical lines and lines at 30, 45, and 60 degree angles. A compass allowed for the creation of circles. Other complementary tools allowed for the creation of other geometric forms. These tools ultimately resulted in buildings that were geometric as well. 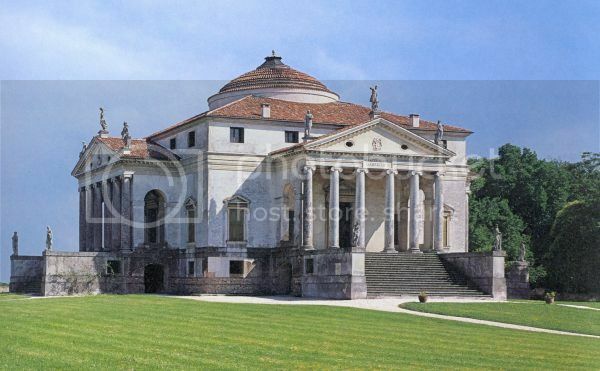 Palladio's Villa Rotunda, considered a masterpiece of classical architecture, when pared down to its essence, is a geometric construct. It is a cube topped by a round dome, with triangular pediments on all four sides. Its fenestrations are either square or rectangular. Architecture is perhaps the most practical of the arts. It is the inherent geometry that has always allowed for architecture to be drawn and constructed. For the past couple of decades architects have been using computers to perform the drawing tasks formerly executed on their drawing boards. This is referred to as Computer-aided drafting, or CAD. Today computer processing speeds, combined with sophisticated software developments, have developed to a point where the vision of the architect can be more fully realized. Consequently, the manifestation of that vision doesn't have to be grounded in geometric forms. The traditional process of design and the corresponding process of construction has been turned on its head. This ability to go back to the literal original vision, undefiled by geometry, is what deconstructivism is all about. 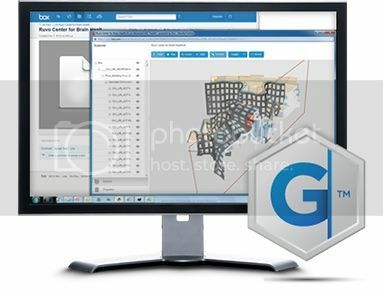 Now non-geometric based forms of architecture can be much more easily drawn, and much more easily constructed, with the aid of computers. The old rules no longer apply. The architect who is most closely associated with deconstructivism is Frank Gehry; his Guggenheim Museum at Bilbao being the poster child. 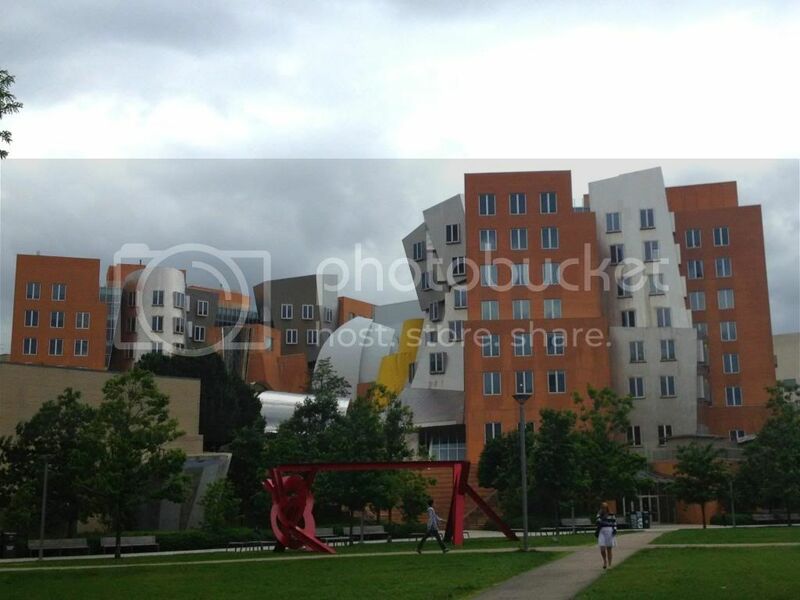 My first encounter with a Gehry building was his 2004 Stata Center. My wife and I were roaming through MIT's expansive campus when we turned onto a wide sidewalk between two non-discript buildings. There, straight ahead, we saw it hulking proudly in he distance. I pulled out my iPhone and snapped this shot. Even though I had an academic understanding of Gehry's work it still surprised me. The closer we came, the more surreal the building seemed. Walls were placed at odd angles, columns appeared in distress, windows protruded from walls, floor plates separated, spaces collided and overlapped. The mix of materials was also unexpected - traditional brick, high tech steel and aluminum sheets, and brightly painted gypsum board all converged. Unexpected curves and angles abound. It's difficult to get one's head around this building. Even now, I'm still not sure how I feel about it. Perhaps the ageless principles of design and construction are so ingrained into me that it is difficult for me to let go and embrace this new architecture, an architecture made possible by new tools, the architecture of deconstructivism. Although new tools have made deconstuctivist works of architecture easier to design and construct, there were still a few significant works non-geometric based forms architecture that predated the modern computer and deconstructivism. This sculptural quality of architecture is the subject of the next post.....Habitable Sculpture. In the case of construction or deconstruction for commercial places and house there is need of architecture and tools to give it best design and ideas. You can get the service of Residential foundation installation for construction at Easter Concrete.